Making choices for your child’s education can be tough. Ian and I struggled with the decision to send our daughter to private Christian school for a long time. We weren’t sure if we should send her to public school, the thing we already pay for, or try out the wonderful private Christian school that our friends had told us about. We made an unpopular decision for her pre-k year. We decided to keep her home even though all of her friends her age started at the private school. I was selfish and wanted to have her at home one last year. It made good sense to me since she would spend the next 12+ years in school. It also delayed our decision about whether to send her there another year. During her pre-k year we decided to attend an open house there and fell in love with the school. It was a small cozy campus that included the elementary, middle, and high schools. The people there were warm and inviting, genuinely nice, and were not shy about sharing their faith with us. Soooo, ultimately we decided to send our daughter to the private Christian school. It all came down to where and with who she would be during the day while she was away from home. I was going to miss her so much… Knowing that she was at a place where she could pray and learn more about her faith, where her teachers could pray with her, and where they could call me in to prayerfully share in her character and education goals made me less anxious about school. This decision did not come easy (or cheap) but it seemed like the right one for OUR family at the time. Fast forward five months… Ian is dying in the ICU, I’m struggling to take care of my kids and home, life is turned upside down, and guess who is there for us? Our daughter’s school!!! From the moment Ian was sick the school sent out emails requesting prayer for Ian and our family. Families whom we had never met selflessly brought meals to my children… Sympathy cards and checks flooded our mailbox (again, people we didn’t even know). Giftcards for HEB, fast food places, and Visa cards were donated to us. School families came together to be the hands and feet of Jesus for our family. *First and foremost, we have made wonderful friendships with families there. It truly is a sweet community that feels like a real family that takes care of one another’s needs. *Friends delivered too many meals to count to our family. Many times with other gifts, too. * Our daughter received a scholarship for this year (1st grade). Our family pays only $100 each month for tuition. Even now, when we run into people at school, they tell us that they continue to pray for our family. When we went to a football game a couple of weeks ago, Ian was like a celebrity! People came up to us and introduced themselves, and I loved putting faces to the names that I had read on Caringbridge and emails. We are blessed that our daughter’s teacher knew her story and can love her accordingly. I am still so grateful that one of my good friends was the teacher assistant in her class last year. I believe that God had her there to love on her through this and ease my worrying mind. These are all things that God took care of through her school. 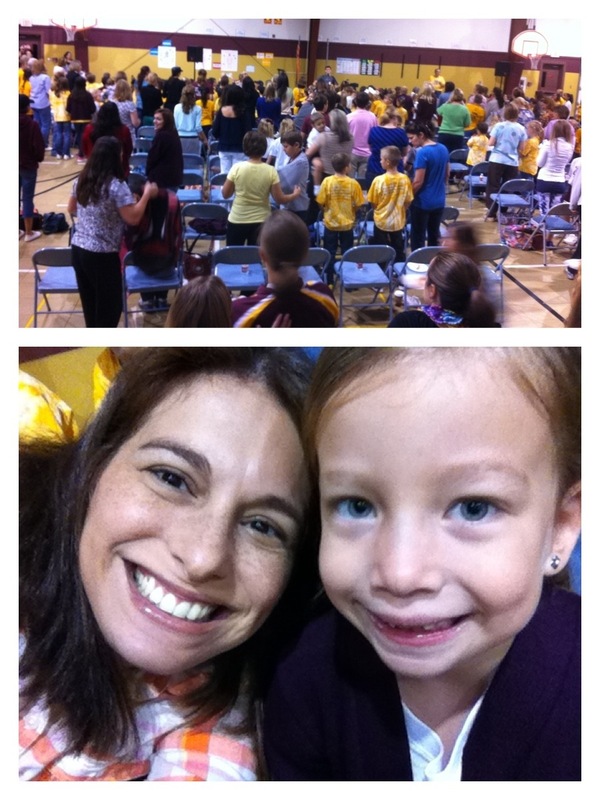 Today my daughter and I woke up extra early for Message with Mom at school. It was great to enjoy a short message and music together to start our day. It was also wonderful to pray over her and all the other sweet children there. What a wonderful place to be! I am so grateful for everything that the people at school have done for our family. I am anxious to be in a place where we can give back even more than we have received! Jack will be old enough to be in pre-k next year and I am already wondering what the best decision will be for him. I am praying for God to make it clear for us to decide what’s best. This post made me a little teary! I love our school, too. My oldest has been there 8 years, and we are paying tuition for three kids now, but I still think it’s worth every penny.